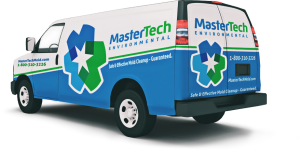 Here at Mastertech, many of our remediation technicians are former firefighters and emergency service workers, so they know first hand the vulnerability that floods, fires, illness, and death can leave behind. Striving to ease our clients’ burdens, every one of us is fully committed to the safety and well being of those we serve. Exceeding industry standards and providing skilled expertise during time of crisis, company owner Tom Duff and his team provides the safest and most effective mold removal and cleanup services possible to restore a clean and safe environmental for you and your family. Above all, Mastertech believes in providing clients with compassionate, respectful service. Our team understands that this can be a stressful time for our clients, and we are here to help ease some of that burden. “We take pride in knowing we can make a difference in a family’s quality of life.” MasterTech owner Tom Duff knows all too well the effects mold can have on a person. He has suffered since the age of 10 with mold-induced asthma and allergies. Our mission is to provide the safest and most effective mold removal solutions to New Jersey residents and business owners. It’s that simple.